The Community Foundation’s approach to charitable investments focuses on utilizing world-class investment managers with a goal of outperforming appropriate target market benchmarks over long periods of time. Our clients trust us to invest their charitable legacy wisely to maximize their generosity. Our prudent investment policy and best practice endowment management position us among the top-performing community foundations in the country. 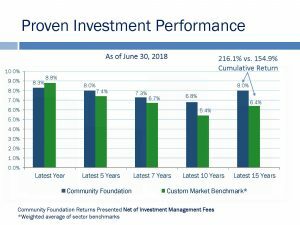 The investments of the Community Foundation continue to regularly surpass our benchmarks over long-term periods, adding an average of 8% per year over the last 15 years. This growth provides significant value to the charitable assets entrusted to us by our clients. The Community Foundation’s Investment Committee remains focused on maintaining a strategy that is driven by long-term objectives. This, combined with the size of our investment pool, allows us to have a highly diversified portfolio with access to the full range of asset classes and top investment managers – all of which can increase the likelihood of exceeding performance objectives. 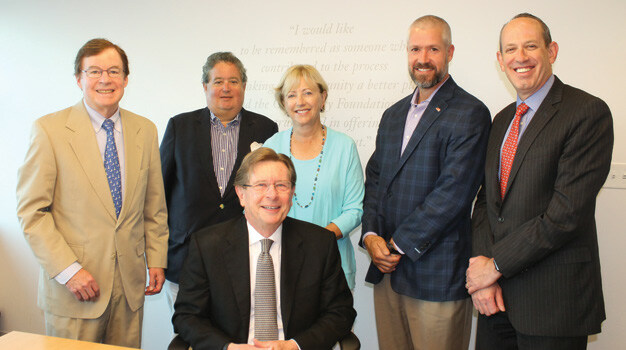 Furthermore, the Investment Committee seeks to continually capitalize on the Community Foundation’s innate advantages. These include a long-time horizon, our stature as an institutional investor, a robust process that is used for ongoing evaluation of specific investments and our portfolio as a whole. The average tenure for Investment Committee members is ten years.